I have read this one many years ago and like 1984 it isn't the kind of book I normally like, but this is so powerful, and like you say parallels can be drawn... enjoy your read. Cleo - Thank you. It is slow going, but I like it so far. I enjoy reading books like this now and then. It's been years since I read 1984, but I remember liking it. I read The Handmaid's Tale several year's ago. While it's not a favorite of mine, it is a powerful novel. In my opinion, we should all read it. I hope you have a good experience with it. Margot - I have heard other people say that--that we should all read The Handmaid's Tale. I am glad to finally be doing it! I think that this is a brilliant novel. I also think that Margaret Atwood is one of our greatest living writers. This is a book that may be a little to disturbing for me to read again. I also thought that the original film is well worth seeing. I look forward to your upcoming commentary. Brian - This is only my second novel by Atwood, but I have heard others say that about her as well. I am glad to hear you liked The Handmaid's Tale. I will have to look for the original film when I finish with it. I likely will want to see the mini series when it makes it out on DVD eventually. I haven't read The Handmaid's Tale and I always feel guilty about it, since it's a classic. Hopefully I can find time to read it soon! Eustacia - I hope you are able to find time to read it soon too--although I say that without having gotten too far into it yet myself. :-) I am glad to finally be reading it. I read this a long time ago and remembered liking it a lot. This is a great time to be reading it. Beth - I thought so too. But perhaps a little too frightening in some respects. I've not ever read THE HANDMAID'S TALE, but have meant to. Perhaps I'll try it during February or even later in the spring. That opening is certainly vivid with sights and smells and sounds. Kay - Atwood certainly has a way of setting a scene. I love her writing. This was one of the reading options in my grade 12 English class, but I've never read it. PD Workman - I never got a chance to read it in school, but I did read 1984 and liked that. I've long wanted to read The Handmaid's Tale. I'm still on the fence about this one. I'll probably read it even though it's not my normal genre. Laura - Sometimes stepping outside your comfort zone can be rewarding. If you do read it, I hope you will find that's the case. I have always wanted to read this book. The opening has a haunting quality, and the idea of a new normal sadly makes it a very relevant read right now. Catherine - It does, doesn't it? It's hard to imagine how different the main character's life once was from what it is now. I loved this one and Atwood in general. I'm happy to see you posting Wendy and hoping that you enjoy this story. Diane - Thanks, Diane. I am glad you loved this one. I hope I do too. It's good to be back--although I have a lot of catching up to do. I reread it after I started blogging, and it chilled me even more. Thanks for reminding me of how much I love Atwood's books (for the most part...exception: MaddAddam Trilogy!). Laurel-Rain - I hope we never experience that world either. This is only my second Atwood book, but I definitely want to read more by her. Reread this a few years ago. Enjoy this classic. My experiences with Atwood have varied, but I should read this one. Jenclair - I can see that. I hear all her books are very different from one another. This is only my second by her (I also read Blind Assassin). I really liked that one and hope I'll fare as well with this one. Ms. M - I love that series! I hope you are enjoying it. I honestly can't believe I haven't read this. I'd definitely keep reading, and probably will one day. Christy - This is one of those books I've wanted to read for a long while but kept putting off. I read and enjoyed The Handmaid's Tale a couple years ago. The Handmaid's Tale was always on the optional list in school so I never read it. I do want to read Atwood one day. Katherine - I enjoyed her Blind Assassin and am liking The Handmaid's Tale so far. Not all of her books appeal to me, but many do. I am sure I will read more by her in the future. I bought this book probably 5 years ago but haven't read it yet. I hope to get to it soonish. I will be looking forward to your review! Carole - I've had my copy for a number of years too. I hope you like it when you do read it! I've read The Handmaid's Tale twice which is rare for me as I hardly ever do re-reads but both times I loved it. You are right, if there is ever a time to read it, now would be a perfect time to pick it up again. Such a great book. Iliana - The Handmaid's Tale seems like one of those books you can get something new out of with each reading. I don't often re-read books either--so I understand how that makes this one extra special for you. I'd read this book a while back and enjoyed it, though the subject terrified me. I think Atwood's books are a hit or miss to me but I think each of her book is unique on its own and she always write interesting issues. Melody - It is terrifying to think of something like this really happening. I read this a long time ago. I hope you enjoy it as much as I did. Mystica - I hope so too! I am liking it so far. A book I read awhile ago and with all of the talk of a new serialisation may well return to. I'm looking forward to reading of your progress. Tracy - I saw a preview for the upcoming series and it looks like it will be very good. It makes me glad to be reading the book now even more so now. I am a big fan of rereads and it's always fun to go back to great books like this - I need to reread this one myself! 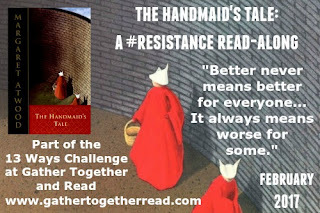 Amy - This is my first time reading The Handmaid's Tale, but from what others have said, it may not be my last. I'll be looking forward to your thoughts on this one. I've always been a little intimidated by Atwood. I do plan on starting 1984 soon. Stacy - I feel a bit intimidated by Atwood as well, even after--maybe especially after--I read Blind Assassin (which I loved, but it was tough). I loved Handmaid's Tale but I was also deeply unsettled by it - so much so that it made me feel as creepy as a horror book would have. And then everything in reality also actually breaks into chaos. I can't wait to read your thoughts on this book! Athira - What I have read so far is very unsettling. I can see why this one would be more so even than a horror novel.